If you’re travelling to a malaria-endemic area, a mosquito net should be on your list of essential travel supplies. Malaria is transmitted by the female Anopheles mosquito that bites humans from dusk to dawn. The Anopheles mosquito is stealthy and silent. They don’t buzz so you can’t hear them approaching. This means you are a prime target when you are most vulnerable — asleep. 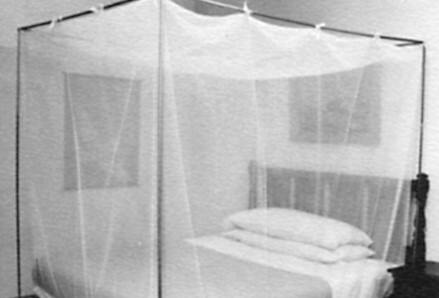 Bed nets are a key defence against malaria, but they also offer protection from other diseases such as filariasis (known for massive swelling of the limbs) and other insects and arachnids like ticks, beetles, flies, and spiders. Remember that in malarious areas, bedrooms without tightly-fitting screens or broken screens require insecticide-treated mosquito bed nets, except in buildings with sealed windows and central air conditioning. From wedge-shaped, to cone or canopy, to rectangular box-style nets, there are many options to choose from. Here are our recommendations for buying a bed net that will give you the best protection. • Different bed net styles provide different levels of protection. Rectangular bed nets are a great option because they reduce your chance of touching the net while you sleep. You are more likely to touch the netting when sleeping under a cone-shaped net, which could allow insects to bite through. • Consider your style of travel. Will you be carrying your net around with you while you move frequently from place to place, or will you spend most of your trip in a few locations? Choose a net that’s light and compact enough to pack and carry easily. • The best protection comes from a combination of protection measures. If you’re in a malaria endemic area, don’t just rely on antimalarial medication for protection. Take meticulous anti-mosquito measures, including insect repellent containing 20-30% DEET or 20% Picaridin and wear light-coloured, light-weight long sleeves and pants. Remember to check your net frequently for tears: Mosquitoes will spend hours searching for an opening so even one tear is too many. If you have questions about malaria or choosing a suitable bed net, check out our How to Protect Yourself Against Malaria whitepaper and World Malaria Risk Chart or contact us. Previous PostAre you savvy about counterfeit medications?Next PostGoing Confidently for 55 Years!